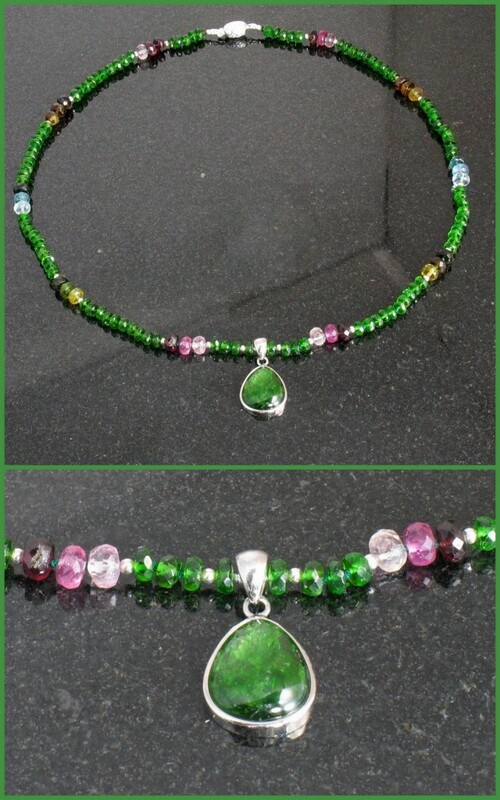 Another wonderful necklace designed by Theresa Kappel ,Green Chrome Diopside with accents of various colored Tourmalines. This would highlight many outfits. Vibrant green chrome diopside is what makes this piece so special. A chrome diopside drop hangs from a strand of chrome diopside accented with stations of tourmalines. The Tourmaline is grouped in threes by hue with pink-maroon at the front, then greens, blues, browns, and more pinks. A sterling silver filagree pearl clasp completes the piece at 18 inches. The necklace is stung on green silk cord with knots for strength and durability.